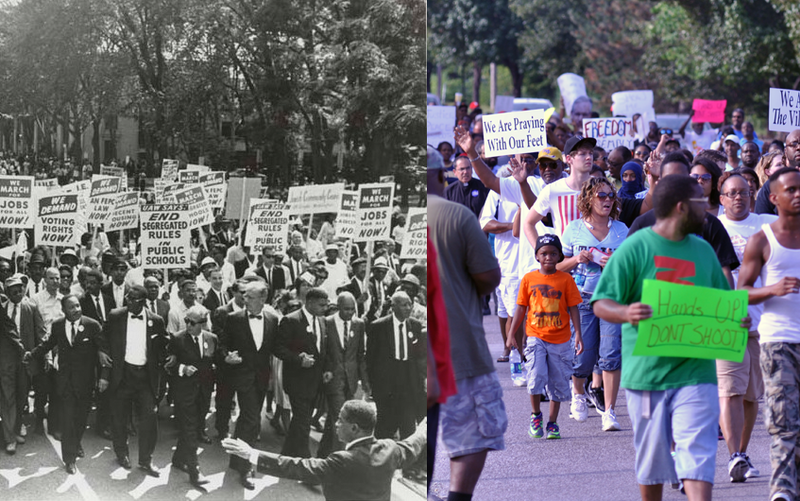 Police use of force on protestors, then and now. Left: Photojournalist Bill Hudson’s image of high school student Walter Gadsden being attacked by dogs, as published in The New York Times on May 4, 1963. Right: St. Ann, MO police officer Ray Albers, who was suspended for pointing his rifle at peaceful protesters. The image was captured on a protestor’s mobile device and shared in a video on Youtube. Documentation of past civil rights protests has given us powerful images of historic note. However, most of them were captured by professional journalists, were edited for suitability, and took quite some time to have their story told on the front pages of the next day’s newspaper or that evening’s television broadcast. By contrast, citizen bystanders and protesters have far easier access to tools they can use to tell the story, live, raw, and unedited, showing the good and bad. Some even argue that if law enforcement agencies adopted similar technology, fewer incidents might occur, or at least there would be less debate about who was at fault. So, what does any of this have to do with digital curation? Quite a lot! With more images, sound and video generated than ever about events like this, a window of opportunity to preserve the footage for history’s stake is opening, and could be rapidly closing soon. Regardless of where you stand in the realm of opinion about these recent events, it is this digital, citizen-generated content from which a truly informed dialogue can emerge. There are other issues as well. How do we verify the authenticity of this content, that they were really recorded in the time and place that we’re told they were? How can we be sure nothing was digitally altered, erased, or edited? How can we be sure that accidental (or maybe deliberate?) deletions of this content prevent the facts from seeing the light of day? The implications surrounding such recordings (which are currently legal in the US) have led civil rights groups to publish articles informing people of their rights. Going further, WITNESS, an organization who aims to train human rights activists on effective use of video, has developed an Activist’s Guide to Archiving Video, which explains how best to preserve the data, why that preservation is important, and what best practices should be followed. Of course, law enforcement agencies have their own concerns about citizen-recorded evidence. For their part, there’s an argument to be made that such video must be downloaded by the agency, directly from the device that took it. Simply e-mailing a copy doesn’t cut it for most legal proceedings, as a chain of custody must be preserved. Obviously, this clashes with the needs and concerns of a distrustful citizen who would have to part with their device for a while, and might have misgivings about what the police might do with it and the data it contains. Obviously, the issues aren’t going away for a while, and there will be much that still needs to be resolved as both police and citizens leverage the technology made available to them, more and more each day.